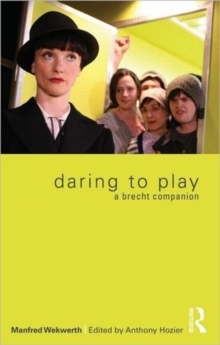 Translated into English for the first time, Daring To Play: A Brecht Companion is the study of Bertolt Brecht's theatre by Manfred Wekwerth, Brecht's co-director and former director of the Berliner Ensemble. Wekwerth aims to challenge prevailing myths and misconceptions of Brecht's theatre, instead providing a refreshing and accessible approach to his plays and theatrical craft. The book is rich in information, examples and anecdotal detail from first-hand acquaintance with Brecht and rehearsal with the Berliner Ensemble. Wekwerth provides a detailed practical understanding of how theatre operates with a clear perspective on the interface between politics and art. Warm and engaging, whilst also being provocative and challenging, Daring to Play displays the continued vitality of Brecht's true approach to theatre makers today.